Eyes are important indicators of overall health, and comprehensive eye care goes beyond a prescription for glasses or contact lenses. At Parkway Vision, we take the time to get to know you, your eye care history, and your vision needs. Our optometrist provides the expert care, advice, options, and follow up you need whether you are a new patient or an existing one. Eyes are important indicators of overall health, and comprehensive eye care goes beyond a prescription for glasses or contact lenses. At Parkway Vision, we take the time to get to know you, your eye care history, and your vision needs. Had a good experience here. The staff is very helpful and the doctor takes her time in answering your questions. No wait time. Will go here again! 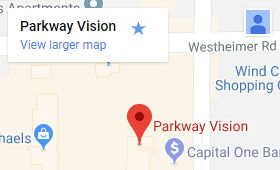 With an office in Houston, Parkway Vision serves Westchase, Memorial, and Energy Corridor– schedule an appointment today. Please call our office at: 281-324-8006 for further instructions. Use your best judgment on urgency, if you feel your need to find the nearest emergency room. If you have a moment, please give us your feedback about our site and your experiences with our eye care center. 2602 Eldridge Parkway Ste. L, Houston. Directions?